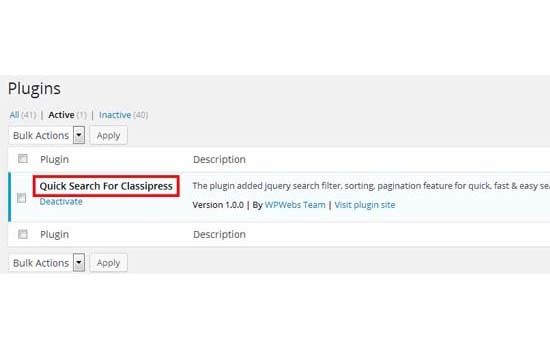 This plugin working for ClassiPress version 4+. 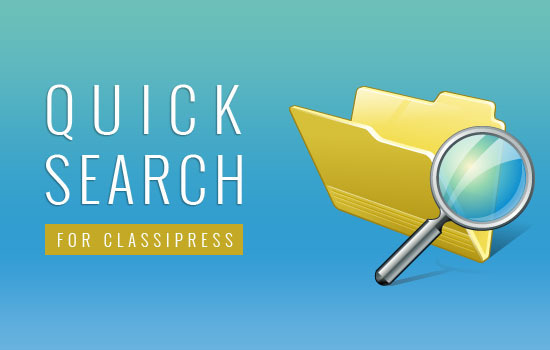 jQuery quick search, filter and pagination to make the search faster, easy & reliable. 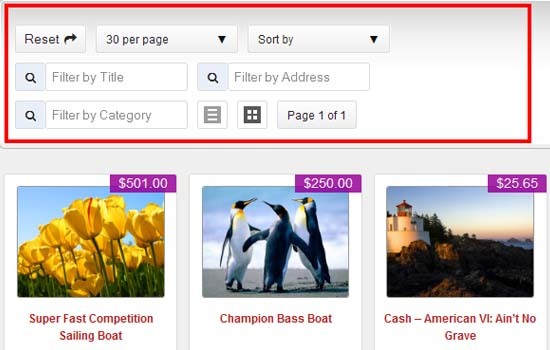 jQuery quick search, filter and pagination. Make the search faster, easy & quickly. Off-line Searching (works good without internet connectivity). 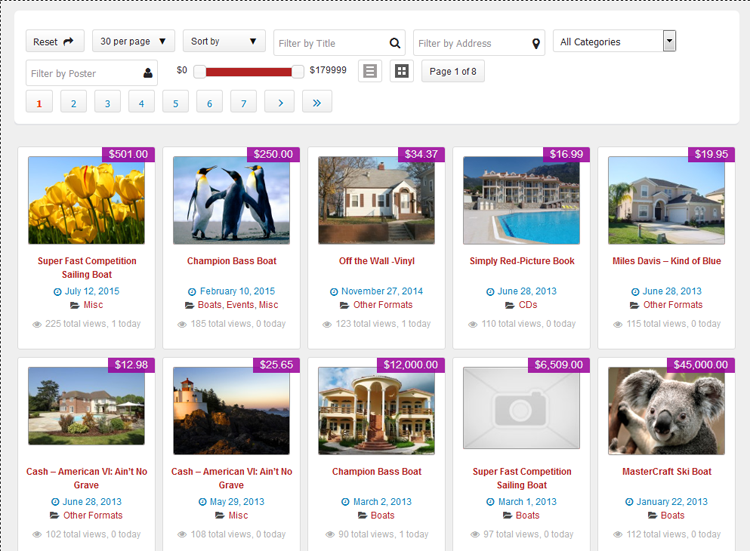 Listing & Grid view option. Display Full page & page width sidebar both page template options. Ads filter by Address (either address,city,state,location,country or pincode). Ads filter by category name. Ads filter by poster name (NEW added after version : 1.0.8). Ads filter by price range (NEW added after version : 1.0.8). Sort by title, price, date & total views. jQuery JSON data to display & search data filter. 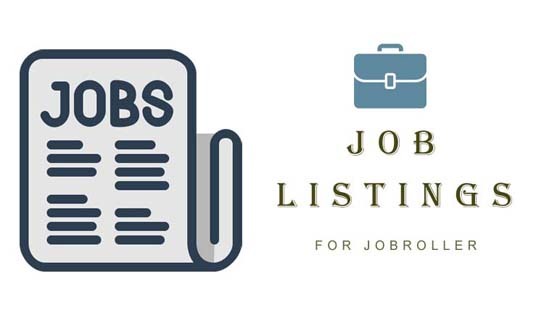 JSON data refresh by wordpress cronjob to manage latest search data. No extra load for sever to search every time. Search data will refresh automatically as per settings time(either every hour/twice a day/daily). 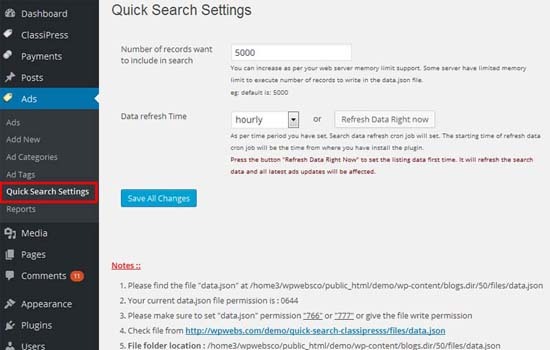 Refresh search data any time manually from wp-admin. It will allow user to hide filter by address & filter by category options. 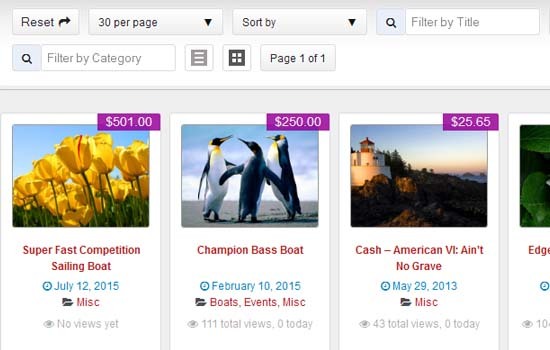 Now allow user to add filter by ad poster & filter by price range. The price range will display minimum and maximum price as per ad data displayed. Please click “Refresh Data Right Now” button to make the price range option start working, otherwise it will display price range zero only. Load data via ajax instead of direct call data via php. Pre-loader added before data loaded. Pre-loader chagne option added from wp-admin > plugin Settings. ==> please replace both below page templates to your current active theme root directory. For some site the plugin don’t display the data – problem solve. Reset Button – show/hide and set sort order. Pagination (list per page) – show/hide and set sort order. Sort by – show/hide and set sort order. Filter by Title – show/hide and set sort order. Filter by Address – show/hide and set sort order. Filter by Category – show/hide and set sort order. Filter by Poster – show/hide and set sort order. Filter by Price – show/hide and set sort order. List/Thumb Switcher Buttons – show/hide and set sort order. Pagination Results – show/hide and set sort order. Pagination Control – show/hide and set sort order. Filter by Price Values – where for Filter by Price settings ->> you can set minimum and maximum price values. Listings Click to open ads detail in new window. Displayed Data Icons like: category icon, address icon, poster icon, date icon, view icon. Search Icons like: Title Search Icon, Address Search Icon, Poster Search Icon. NEW FEATURES for Add custom fields. Add & manage new custom field & related settigns from plugin settings. Display/Hide custom field value for list or grid or for both. Manage custom field related search option text box or select box. Q :: Why cannot see the templates while add/edit pages? A :: The plugin copy the template files first time while plugin activated to the current active root folder. your theme folder don’t have permission to create new template file and copy the content, It may be possible. 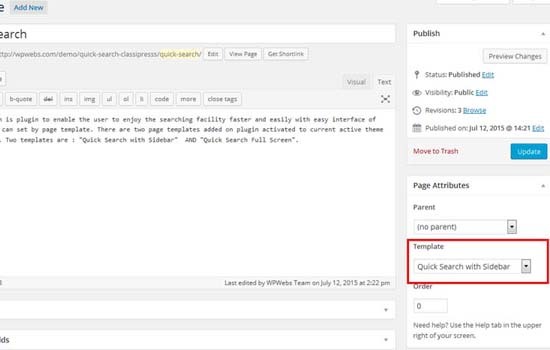 Q :: What I should do if no template while add/edit pages? A :: You should add the template files manually. — get php template files inside the folder. 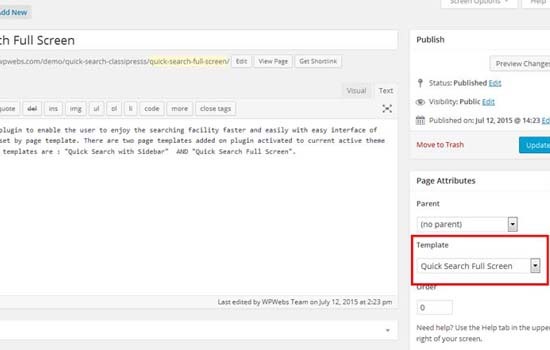 — Go to wp-admin > Add/Edit pages > see the template added in “template” selection box. Q :: How the plugin settings can I should check? A :: Go to wp-admin > Ads (left menu) > Quick Search Settings > Check the settings. — Please find the file “data.json” related nots. — Check current data.json file permission. — Get the data.json file folder location & open it. — If this is first time plugin activation then you should press “Refresh Data Right Now” button. — You may change maximum data limit as per your server capacity. — Because many server have memory limitation so cannot collect much data to write in data.json. Q :: All settings are ok and data.json not empty then also why cannot see listing & search ?? — You can see the demo and it is working good with classipress. Q :: What is plugin limitation? A :: Normally there is not limitation for the plugin but if your server memory is limited. — If you increase records maximum limit for search data.json, the server limit may create problem for some shared hosting company. — If you may have bought the plugin and the memory limit is the problem, of cause the refund if your right. Q :: What to do if our website records is larger? — See the link below to get problem & solution in case of large website data. It will allow you to hide Address & Category filter. 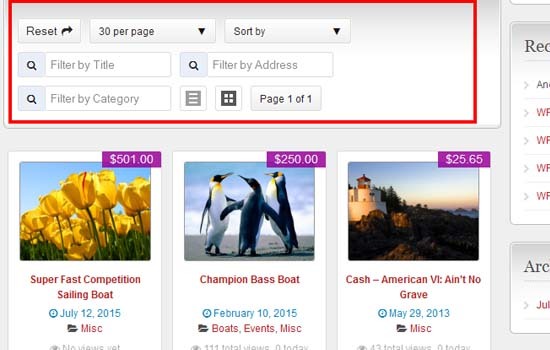 also allow you to add Filter by ad Poster & Filter by Price Range. >> same way you can add any additional css from same option without change any file. 4) Go to wp-admin > Pages > Create new page > example “New Page”. choose any one as per you like most for your site as home page. 7) Go to wp-admin > Ads (left menu) > Quick Search Settings > you should press “Refresh Data Right Now” button. 8) Once the data.json file will generated the search data will start working. 9) If any problem, please read note on the same page and follow steps carefully one by one. 10) Read Usage, Notes & Developer Notes Carefully. 11) See the screen image attached with the plugin folder to have visual help what to do. Note : Please refresh the search data for each update in case of change in data optimization. — Solve some Java Script problems. — solved some php warnings. — Display search fields as per order set from custom fields plugin settings. — Hide custom fields if there is no value added for ad. — Custom field — special characters created problem & search not working – problem solve. — Display field order (new field settings) for custom field settings added. — Custom Field title added to dispaly with data on search. — Some HTML update done. — Custom fields controls are not shown if you hide the ‘filter by poster’ — error solved. — Reset button does not reset the price range slider – error solved. — For more than one select box, if user serach the combination of all selectbox, now working properly >> error solved. — Jquery and quick search core jquery code updated as per laster version. — Add custom fields NEW feature added. — Add new custom field related settings from plugin settings. — Display/Hide custom field value for list or grid or for both. — manage custom field related search option text box or select box. — Admin custom css add not saved properly – problem solved. — IMPORTANT : you have to press “Refresh Data Right Now” button from wp-admin > plugin settings for data.txt to create. — If data.txt not created you should create data.txt on the error message path as per dispaly while you click “Refresh Data Right Now” button. — OR see the new data.txt path below the settings NOTE section. — Some Css upgrade done. — Data Refresh Cronjob not working properly – Very important Problem solved. We updated and now for small device, it will display like full screen and big image. — Data refresh cronjob setting activation and deactivation problem – Solved. — Cronjob not deactivated while plugin deactivated – Problem solved. — Non-english website, search not working – Problem SOLVED. — Added new action hooks to controll quick search options. — Added new filters for display data in quick search listings page. — Related instructions aded for how to add custom fields for search and dispaly to user by using code. — For some site the plugin don’t display the data – problem solve. — Default display view selection. — Listing per page settings. — Reset Button – show/hide and set sort order. — Pagination (list per page) – show/hide and set sort order. — Sort by – show/hide and set sort order. — Filter by Title – show/hide and set sort order. — Filter by Address – show/hide and set sort order. — Filter by Category – show/hide and set sort order. — Filter by Poster – show/hide and set sort order. — Filter by Price – show/hide and set sort order. — List/Thumb Switcher Buttons – show/hide and set sort order. — Pagination Results – show/hide and set sort order. — Pagination Control – show/hide and set sort order. — Filter by Price Values – where for Filter by Price settings ->> you can set minimum and maximum price values. — Listings Click to open ads detail in new window. — Displayed Data Icons like: category icon, address icon, poster icon, date icon, view icon. — Category drop-down instead of input. — Admin settings code file separation. — PHP code cleaning and enhancement. — Load data via ajax instead of direct call data via php. — Pre-loader added before data loaded. — Pre-loader chagne option added from wp-admin > plugin Settings. — Poster name display was problem – Solved. — It was display first & last name instead of Display name – now correction done. — Search is working on poster display name, first & last name. — It will allow you to hide filter by address & filter by category options. — Also allow you to add filter by ad poster & filter by price range. — The price range will display minimum and maximum price as per ad data displayed. — Please click “Refresh Data Right Now” button to make the price range option start working, otherwise it will display price range zero only. — Css change for search filter. — Removed search icons and added new icons with new look. — added “Remove Sold Ads ?” option from plugin settings. — it will never display the sold ads if selected. Note : you should press “Refresh Data Right now” button as soon as changed above settings. — Plugin not working for more than 500 records now pluign changed and it working for 1000 listing without any problem. some times for 2000 may be feel the user slower but still it is working ok.
— Search data json optimization. Please click the “Refresh Data” button to get latest updated otherwise the plugin will not work. 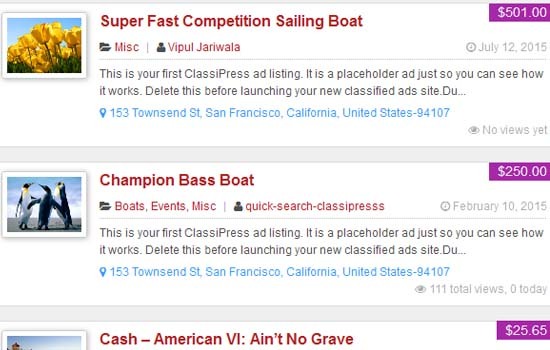 Yes we have updated the plugin and it is working ok with ClassiPress version 4. Hello, could I filter by user role? 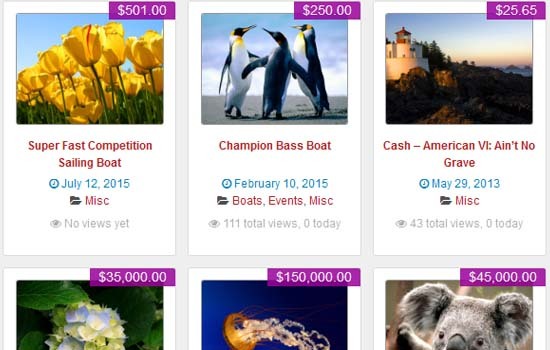 I have a classifieds website and I need filter by professional or particular. Actually there is no such direct facility in this plugin for current version but you may need to customization and add this features using plugin action hooks. Can we add custom fields in the Search filter like the ones found in Refine Search in CP? Your Demo site does not show the plugin in action anymore. Yes you can add custom fields which you have added for Post Ad form. I just purchased and installed your plugin, I’m under the Manage Custom fields tab, I tried enabling different types of fields but only the Drop-Down fields work, all other field types do not display (Radio, Checkbox,). You are right, plugin support only text box & drop downs because of some technical problems we don’t have added other like Radio, Checkbox,. You mean it only supports Drop-Down and text-fields, do you have an estimated time of when this will be fixed? We was working since many time but no luck so we drop to add more featured for now. Thank you for clarifying Vipul, your plugin does a good job so far.